Doctor, it hurts when I do this! In one of my frequent meanderings around the office the other day, I noticed a two-inch-thick stack of tree guts gathered on one of our reporters’ desks. Apparently, the plethora of paper was an unsuccessful state worker’s compensation claim filed in 2004 by SLO County sheriff’s candidate Joe Cortez. I snuck a peek, and to my untrained eye, it seemed Cortez claimed everything under the sun—which included marking a box for permanent disability—in regard to a cardiovascular problem and hearing loss he claimed arose from his then less than three years as Pismo Beach chief of police. According to the claim file, my peeking revealed, his injuries arose from the “stress and strain” of his employment. In a transcript of Cortez’s deposition for the claim, he testified that even with his hearing aids, he still had “a real difficult time hearing the radio or understanding the radio.” He also said that sometimes the tinnitus—that’s ringing in his ears—was so bad, “the hearing aids don’t help whatsoever.” Cortez also apparently claimed that because of his heart condition, he had to reduce his level of exercise, though it didn’t keep him from performing his duties. I tried making a heart claim once here at New Times. Nobody cares that I break out in a cold sweat and my left arm goes numb while I’m typing. So it goes. An administrative law judge turned down the claim—Cortez’s, not mine—predictably finding that his heart condition was indeed caused by his position as a peace officer but that it didn’t result in permanent disability. In terms of his hearing, the judge found that it preexisted his employment with the city. What did Cortez end up getting? A piddly $2,484.34 to cover medical expenses. I overheard one of our reporters talking with Cortez about the issue. Cortez said it’s not unusual for an applicant to claim permanent disability when faced with a work-related issue because “you never know what’s down the road.” However, according to Pismo Beach Human Resources Officer Debra Garcia, a state workers’ comp claim typically precedes filing for disability through the city’s disability pension program. Look, if Cortez is elected—heart and all—somebody will have to tell him that the ringing he hears isn’t his tinnitus any more; it’s his phone lighting up with people calling to see if he’ll make up for the failings of his predecessor in the sheriff’s department. To be fair, I think fellow sheriff’s candidate Ian Parkinson filed a claim once after he got into a bit of a physical exchange with some street toughs, but he does karate or jiu-jitsu or something these days, so nobody’s questioning his physical fitness. In other news, San Luis Obispo High School is starting a process that might result in banning Mark Mathabane’s autobiography Kaffir Boy. The book, an account of South African apartheid, has one anonymous complainer all antsy about a reference to molestation. I won’t go into the details, because News Editor Colin Rigley already wrote about it on page 10. Sept. 25 through Oct. 2 also happens to be the American Library Association’s Banned Books Week, in which the association encourages people to read banned books in celebration of the First Amendment and, how do I put this delicately, stop ruining something for everyone just because it makes you uncomfortable. Mind you, this is an autobiographical tale, though, meaning that it’s not just some pervo with a creative mind trying to bore filth into the gray matter of high school students. Banning such a book is like washing away reality. Moving on. I’ve said stupid things before, sure. Hell, just take a look at my haircut, which was made at my request. Oh, that’s right, you probably can’t see me. You may have to smoosh your face against the page and squint really hard. My flapping gums have resulted in a Tea Party bumper sticker I can’t pry off, an unmentionable tingling in my unmentionable region—maybe it’s time for another claim!—and a lifetime subscription to Teen People. But I’m just this dopey little twerp with too much spare time and as much influence as a crazy person passing out newsletters on the street. However, if SLO City Attorney Christine Dietrick was sitting next to herself when she said the following, she would’ve smacked herself to get herself to shut up, which would’ve been weird. Staff Writer Robert A. McDonald tells me—I think he also wrote something about it last week, but I’ve been rolling up the issue and using it to discipline other people’s children—Dietrick said at the last City Council meeting that the city can claim being too poor to pay historical home fines on its dilapidated adobes. “City Attorney Christine Dietrick said the city could claim ‘economic hardship’ and therefore avoid the strict penalties called for by the ordinance,” McDonald reported. It’s common knowledge that the city is paying its bills with Monopoly money. This week, McDonald also dove into the salary and pension rates for city employees that are slowly but surely bankrupting the city, their employer. It’s a tightrope to say the least. The unions tend to scream about needing more bargaining power or they’ll jet and the city will lose services. But if they continue to rake in infinitely expanding pay, the city will go broke and they’ll be out of work. I guess we’re screwed either way. At least our electrical boxes are pretty. Dietrick, for instance, makes $155,012 in salary alone. Tack on another $42,901 in pension, $3,000 for a city car, and a few other perks, and she’s got a $222,330 compensation. She’s not the only one—just go read the cover on page 6. Come to think of it, don’t listen to me. I should be banned. There is no Shredder, but the spoon exists. 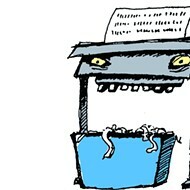 Write to shredder@newtimesslo.com.